What a week it has been. We’ve seen hints of summer, snow in the mountains, heavy rain in the valleys, and another taste of summer. The hills are green, birds are singing, the sun is shining, and fly fishing has been great in Bozeman, Montana. The Missouri River has continued to spoil our guides and anglers with great fly fishing despite high flows. Catch rates have been great and we’ve been seeing lots of healthy and fat rainbow and brown trout coming to the net. This continues to be can’t miss fishing. The Madison River has continued to run high as the flushing flows carry on. Makes things tough for the time being, but will re-open lots of old spawning beds that have been filled with silt. Patience will pay off and we should see phenomenal fishing the next few years. Local freestones continue to run high and muddy. For anglers needing their fix closer to Bozeman, MT check out the Paradise Valley Spring Creeks. Still fishing great. Yellowstone National Park is open for fly fishing again. The rivers are running high but look to the lakes for great early season fishing. Many of them are well worth the hike. Read below for all the details or give us a shout at 406-579-9553. 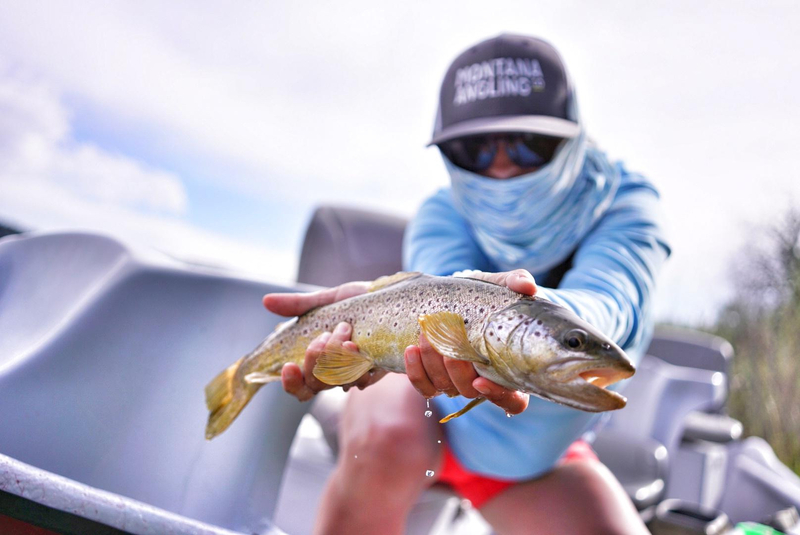 If you have been keeping up with us this spring you already know the trend: Fly fishing on the Missouri River has been nothing short of great since mid-March. High flows have been keeping the wild trout of this tailwater well fed with a constant supply of food. This has translated into great fishing for our anglers and our Montana fly fishing guides. Flows are just below 20k and will probably cross this mark soon thanks to the recent snow and rain. The forecast looks hot and sunny for the foreseeable future which means more water in and more water out. Nymphing will continue to be the best option for consistent fishing success. The river looks big and featureless but anglers need to fish it small and deep to find the fish. Sowbugs, scuds, worms, and the rest of the staple tailwater fare have been our top-producing flies. The river has been busy from the Dam to Craig but wide open downstream for those who want to avoid the crowds. Caddis and mayflies have been hatching daily. Quite on the surface but have been producing subsurface results in the afternoon. Stop by the Trout Shop Café after fishing for great food and cold beer. The Madison River continues to run high, holding at just over 3000 CFS at Kirby Ranch and well over 5000 CFS below Ennis Lake. This is very high by any standard for these rivers. Floaters should exercise extreme caution during this highwater period and avoid all low hanging bridges. Wade fishermen need to respect the water as well. Despite this fishing has been fair with large streamers and big nymphs being our favorite flies. Find the soft water, fish the banks, and don’t be afraid to add extra weight to get your flies down. Would head elsewhere for dryfly fishing. Hatches have started to quite down as we enter the BWO to PMD transition period. Look for a mix of a variety of insects mid-morning to late-afternoon including both varieties of mayflies, caddisflies, and midges. Nymphing with midges, sowbugs, and a variety of mayfly nymph will produce all-day action. We’ve seen great numbers of fish on both Armstrong and DePuy’s Spring Creeks. There are fish top to bottom in both, but the lower end of DePuy’s Spring Creek is backed up and will continue to be until the Yellowstone River drops. Which could be awhile. Check out our latest guide to fishing the Montana Paradise Valley Spring Creeks for more scoop. High flows, lots of mud, and whole cottonwood trees floating down river is about all we have to report on. Check back in July. The 2018 Yellowstone National Park fly fishing season has started but reports have been mixed. Rivers all over continue to run high. Lakes have and will be the best option looking forward for the next week. The Firehole River will hopefully come into form later this week or next. Then it is game on. For anglers willing to hike, early season lake fishing in Yellowstone can be great. Small streamers, dryflies, and nymphs can all be effective to fool these lightly pressured backcountry trout. Get your map, bring your bear spray, and get hiking for early season fly fishing success in Yellowstone National Park.